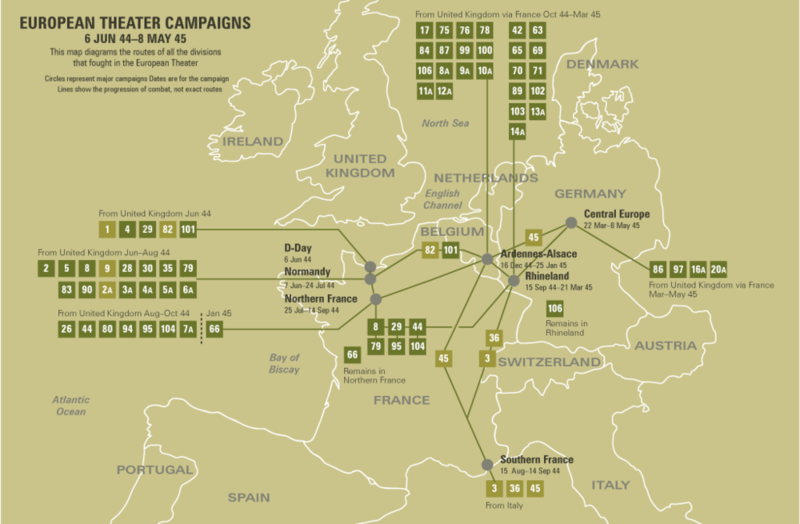 The 35th Infantry Division arrived in England, 25 May 1944, and received further training. It landed on Omaha Beach, Normandy, 5-7 July 1944, and entered combat 11 July, fighting in the Normandy hedgerows, north of St. Lo. The Division beat off 12 German counterattacks at Emelie before entering St. Lo, 18 July. After mopping up in the St. LO area, it took part in the offensive action southwest of St. Lo, pushing the Germans across the Vire, 2 August, and breaking out of the Cotentin Peninsula. While en route to an assembly area, the Division was "flagged off the road," to secure the Mortain-Avranches corridor and to rescue the 30th Division's "Lost Battalion," 7-13 August 1944. Then racing across France through Orleans and Sens, the Division attacked across the Moselle, 13 September, captured Nancy, 15 September, secured Chambrey, 1 October, and drove on to the German border, taking Sarreguemines and crossing the Saar, 8 December. After crossing the Blies River, 12 December, the Division moved to Metz for rest and rehabilitation, 19 December. The 35th moved to Arlon, Belgium, 25-26 December, and took part in the fighting to relieve Bastogne, throwing off the attacks of four German divisions, taking Villers-laBonne-Eau, 10 January, after a 13-day fight and Lutrebois in a 5-day engagement. On 18 January 1945, the Division returned to Metz to resume its interrupted rest. In late January, the Division was defending the Foret de Domaniale area. Moving to Holland to hold a defensive line along the Roer, 622 February, the Division attacked across the Roer, 23 February, pierced the Siegfried Line, reached the Rhine at Wesel, 10 March, and crossed, 25-26 March. It smashed across the Herne Canal and reached the Ruhr River early in April, when it was ordered to move to the Elbe, 12 April. Making the 295-mile dash in 2 days, the 35th mopped up in the vicinity of Colbitz and Angern, until 26 April 1945, when it moved to Hanover for occupational and mopping-up duty, continuing occupation beyond VE-day. The Division left Southampton, England, 5 September, and arrived in New York City, 10 September 1945.